Hello everyone! I'm so glad to be back here at the Bugbytes to post a project. With Mother's Day approaching I had to dedicate my crafting time to making cards for the special mothers in my life. I've made several different Mother's Day cards and have decided to post this one I made for my niece. This will be her first Mother's Day and I wanted to make her a special card. 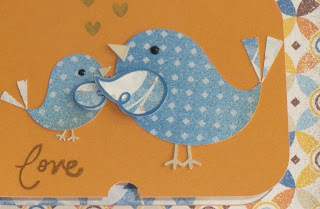 If you would like to see my other Mother's Day cards, please check my blog this week to see a new card I am posting daily. I love my Cameo and the images I can buy from the Silhouette store. I was very excited to find card bases featuring shapes with swing out "doors". They remind me of some dies I purchased from Stampin up a few months ago to make small windows. The beauty of the Silhouette images is that they can be resized to use as actual card bases, or decorative elements for other projects. The 5 die set from Stampin Up cost about $25.95. With my Silhouette store subscription (that I purchased with a 25% off coupon) those same five shapes cost me about .50. That just blows my mind! I added two Echo Park Bird shapes I purchased from the Silhouette Store. I manipulated them so the wings were faced outward, so I could position the Mama bird and Baby bird as if they were reaching out to each other. I also copied the wings and made shadow blackouts, as the original shapes were just outlines. The Cameo makes manipulating shapes so easy, the possibilities are endless. Behind the front flap is a sentiment also purchased from the Silhouette store. I did not make this card as recommended, which is to glue the front to the back and have just the flap open up for the sentiment. Instead, I left the front and back of the card open and added mats that I made by resizing the card base to suit my needs. This allowed me to add a personal note inside the card in addition to the "Mom's are Special" phrase. Materials used: All solid and patterned cardstock from the My Reflections Paper kit (Close to My Heart); Stamps: "love" (Studio G); hearts (Stampin Up); Ink: Soft Suede and Baja Blue (Stampin Up); Stickles: Black Diamonds (Ranger). Stampin Dimensional adhesives used to pop the wings. Thanks for stopping by and checking out my project. Please stop by my blog and become a follower, if you haven't already. I'm hoping to have a giveaway as soon as I clear the cobwebs from my brain and think it through! This card is soo cute! Love the birds! Carole, what a sweet card! It's really is so very cute! Carole this is simply adorable. 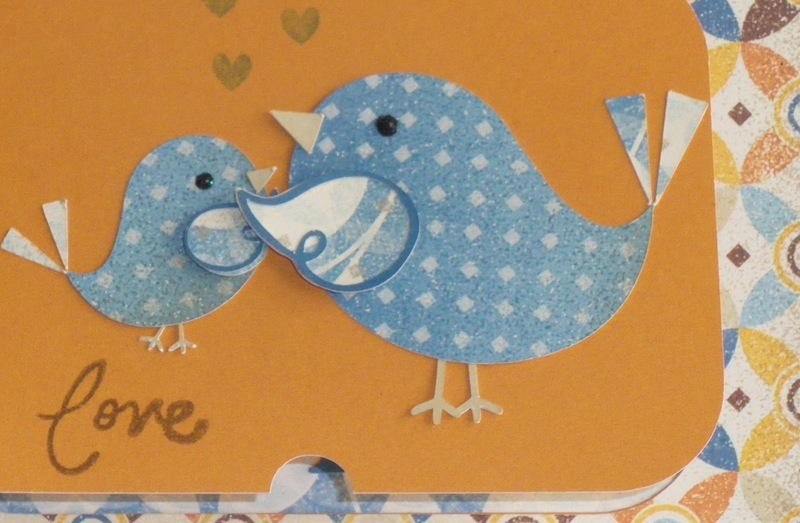 Like the way you add the bird to it...Can it be used similar in Gift Card envelopes?